Homepage. 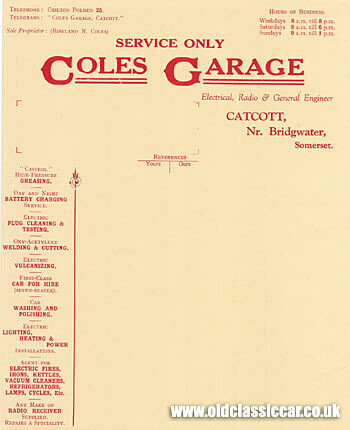 This page: Unused headed paperwork from this Service-only garage in Somerset. Another old billhead featured on oldclassiccar, this time for an olde worlde garage that was situated in Catcott, near Bridgwater in Somerset. So they really were into a diverse range of services. In the 1920s car ownership was still the preserve of those with a bit of money to hand, so perhaps there weren't enough local car owners keeping Coles Garage busy at all times, which may explain why these early garages had to vary their services in order to keep the till ringing. Vulcanizing, or vulcanising, has nothing to do with Mr Spock or Star Trek, but rather the repair of punctured tyres (or the tube within). Vulcanisation is literally the joining of sulphur with rubber by means of heat. The rubber will acquire a certain level of hardness, but still retaining a sufficient amount of elasticity, or flexibility. The mention of vulcanizing in the context of an old motor garage will refer to the repair of tyres, where the rubber is, to all intents and purposes, 'welded' through the gentle application of heat, to repair punctures or damage to the rubber. Such repairs would be made using a vulcaniser, a machine that applied both heat and pressure to the area being repaired, to effect a repair. A picture of a Romac Vulcaniser can be seen in the vintage motor advertisements section here at oldclassiccar.